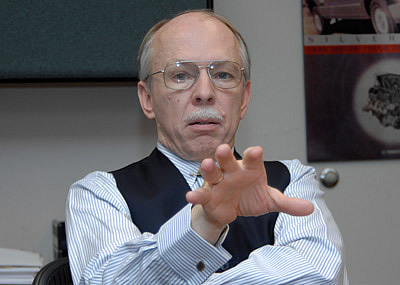 The "top engine guy" means Sam Winegarden oversees all engine engineering at General Motors. We never suggest that Sam skews his decisions in the Vette favor but we are thankful, the serious mover/shaker he is, Mr. Winegarden has a soft-spot for Corvette. Back in January of 2008, during our Michigan visit to research our series of articles on the LS9, we landed an interview with the top engine guy at General Motors, Sam Winegarden. The CAC had talked to him before, but it was all short encounters at different media briefings. This time, GM Powertrain granted us a full-hour of face time with Mr. Winegarden who, at the time was GM Powertrain's Executive Director of Engine Engineering. Winegarden retired in late-July, 2013 after 44 years at GM. At this point in time, five years after the LS9 was announced, it's interesting to read the back-and-forth between reporter, Halverson, and Mr. Winegarden about technology which eventually showed-up in the C7's LT1 engine. 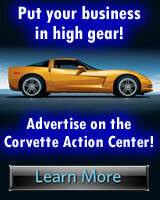 Corvette Action Center: Tell us about your career. Sam Winegarden: I started at General Motors Institute and I was sponsored by Buick. I graduated in 1974, then worked in engineering at Buick and spent the first part of my career working on the 3800. When I was a student, we bought it back from Jeep, installed the equipment up in Flint and started to use it again. CAC: The 3800 "Series I" or the 3.8-liter V6 of the 80s? SW: Yes, the 3.8-liter, odd-fire, V6. I started doing emissions and calibration work. CAC: What year was that? SW: '75 to '78. I worked in development, validation and program management. Then become a Chief Engineer at BOC-Detroit Powertrain (the old Buick/Oldsmobile/Cadillac Group). I was chief for the 4.9 (Cadillac's last in-house, pushrod V8) and the original 4.6 Northstar V8 which has a special place in my heart. The first engine you get to be Chief for is kind of special. Then, I did the Premium V6. Right at the time that was ready to go into production, I came back from Phoenix (GM Desert Proving Ground) one afternoon, landed at the airport. My boss called and asked me to come into the office where he said, "Ed Koerner's moving to truck. You've got the Small-Block." I had a big grin on my face as I walked out the door. To be Chief for the Small-Block is the premier job in General Motors, in my opinion. About a year later, we started planning for Gen 4. I got to launch that and then, in April of 2005, I got this job. CAC: The Small-Block years...of what are you are most proud? SW: Any Vette engine we ever did. Those were always a high point. If I had to pick one...the LS7. At the time, it was the epitome of making power for the Vette. AFM, from a fuel economy perspective. AFM (the active fuel management cylinder deactivation system) for the full-sized trucks, was kind of neat to put into production. Probably those two things, of many years of having a blast being the Chief. CAC: I would have expected you to say the LS7 but, AFM-what occurred during that program that made it a high point? SW: I went to Detroit to be the Chief for the original Northstar in 89, not too long after the demise of the 8-6-4 (The Cadillac V-8-6-4, a V8 notorious for its early cylinder deactivation system) when that technology didn't work so well. With AFM, I had the opportunity make it work this time and that was pretty cool. The secret was in the electronics which made it seamless, smooth and enabled us to get the fuel economy it does. AFM is the start of GM's fuel economy strategy going forward on gas engines, where you take a big engine and make it look small by dropping the cylinder count when you don't need it and then using all the cylinders when you need to pull a load. AFM is an electro-hydraulic system that makes a V8 run like a V4 at light throttle. It uses oil pressure to deactivate the valve lifters, closing-off four cylinders when you're driving easy and want increased fuel economy. It was the first installment of that strategy and it was great to be on the ground floor. 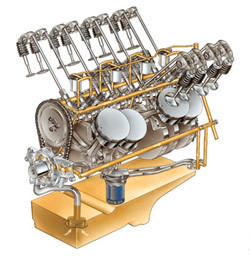 The second half is to take a small engine and make it look big...take a four-cylinder or a six and boost it. SW: Yep. It's, also, on the V8 in Impala and there are a couple of high-value V6 applications. CAC: What kind of hobbies do you have, Sam? SW: I'm a big hockey fan. I've been a (Detroit Red) Wings fan all my life and a (Montreal) Canadians fan. Our youngest son went to Michigan State and played hockey there. Both grandsons play, so we spend a lot of time at ice rinks this time of year. I go to a lot of Wings games and all the grandkids' games I can get to. Then, I do woodworking...cabinet making. If I had to make my living at that, based on my piece rate, I'd starve to death, but I have a lot of fun doing it. I do some photography and reading. I like swimming and running. CAC: What's the last book you really liked? SW: "What If". It's a book that goes through various events in history and says,"Well, what if this hadn't happened?" CAC: What kind of cars do you own. Winegarden and his Velocity Yellow, 2007 Convertible. In the background is the "Mothership", GM Powertrain's World Headquarters in Pontiac, Michigan. SW: An '07 Corvette Convertible, yellow, black top. I've almost always owned one. There were a couple years when the kids were playing hockey that I didn't have the Vette. I couldn't afford both at the time. I'm looking to do an upgrade here, shortly. CAC: You gonna order an '08? SW: I'd like to get an 08 LS3 with the optional exhaust and suspension. Another yellow convertible with a black top. That's still my favorite choice. 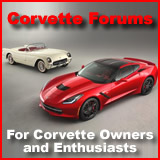 CAC: What's your favorite Corvette? SW: '63 Split window Coupe. It would be a dream of mine if I could get my hands on one of those. CAC: What's your daily driver? SW: Today, it happens to be an Escalade EXT with a six-two in it. SW: (laughs) Absolutely, given the snow on the road today and the mess out there. CAC: Ok. Let's talk about LS9. 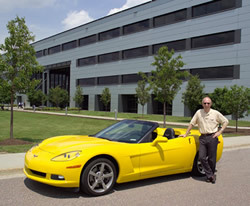 Why did Powertrain decide to supercharge the ZR1. SW: The supercharger packages well in a V8 because you can tuck it down in the valley-as opposed to twin turbo packaging down on the sides which gets a little tough. Also, we wanted to do a family of supercharged engines with the LS9 as the first one then extend that into some other Small-Block applications including, maybe, trucks. The torque from a supercharged engine is attractive both for low-end performance on the Vette and for other parts of our portfolio. Secondly, we had discussions with Eaton about their sixth generation blower and its capability and efficiency made it attractive. The two just kind of happened together.